Detectives have urged people to be aware of cold callers at their homes following five burglaries across different areas of the city on Thursday and Friday last, January 11 and 12. 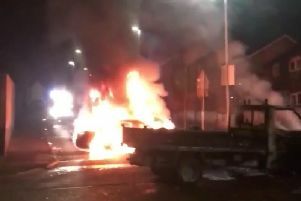 Speaking about the incidents at Woodbrook, Pennyburn and Altnagelvin on Thursday, PSNI Detective Constable Brennan said: “We believe these three incidents may be linked. “In the first, entry was forced to the rear of a property in the Messines Park area between 6pm and 6.45pm. “The house was ransacked and items of jewellery taken. No-one was in the house at the time. “The second burglary was reported at around 7.20pm in the Glenmore Park area of Altnagelvin. “We believe that sometime between 3pm and 7pm, entry was forced to the rear of a property and it was ransacked. Again, no-one was in the house at the time. A sum of cash was stolen along with a number of personal items including a watch. Police are also investigating a potential link between two other burglaries which occurred on Friday in the Waterside and Templemore areas. It was reported that sometime between midday and 6.25pm on Friday a house in the Riverside Park was entered and a number of items of jewellery were taken. It was also reported that sometime between 4.35pm and 5.30pm a house in the College Glen area of the city was entered but nothing has been reported to have been stolen. Det. Const. Brennan has advised everyone to be aware of cold callers at your door. “Most will be genuine but some could be trying to gain access to look around your property,” he said. “Not all are rogue traders – but some are. Unofficial traders can overcharge unsuspecting and often older householders for poor quality work or work that is never completed at all. “Others may try to sell shoddy or over-priced goods, or attempt to trick their way into your house to commit a burglary. “Anyone who saw any suspicious activity in the three areas targeted on Thursday around the specified times, or anyone with any information that could assist with our investigation, is asked to to contact detectives in Strand Road on 101 quoting reference 1140 of 11/1/18. Anyone with any information about the two incidents on Friday is asked to quote reference 1033 or 1104 of 12/01/2018. “Alternatively, information can also be provided to the independent charity Crimestoppers on 0800 555 111 which is 100% anonymous and gives people the power to speak up and stop crime,” Det. Const. Brennan said.